The following is the Boxing Insider notebook for the week of February 5th to February 12th; covering the comings and goings in the sport of boxing that you might have missed. The two-part HBO Sports documentary WHAT’S MY NAME | MUHAMMAD ALI, chronicling the extraordinary life of one of the 20th century’s most iconic figures, debuts TUESDAY, MAY 14 (8:00-10:40 p.m. ET/PT), with both chapters airing back-to-back in a special television event, it was announced today by Kary Antholis, president, HBO Miniseries and CINEMAX Programming, and Peter Nelson, executive vice president, HBO Sports. The documentary will also be available on HBO GO, HBO NOW, HBO on Demand and partners’ streaming platforms. WHAT’S MY NAME | MUHAMMAD ALI is the first feature-length HBO production from SpringHill Entertainment, with LeBron James and Maverick Carter serving as executive producers, and is directed and executive produced by acclaimed feature-film director Antoine Fuqua (“Training Day,” “Southpaw,” “The Magnificent Seven,” “The Equalizer” franchise). 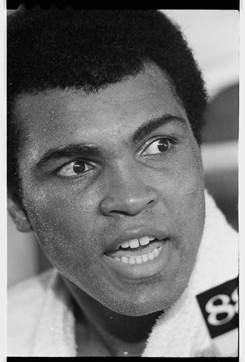 Exploring Ali’s challenges, confrontations, comebacks and triumphs through recordings of his own voice, it paints an intimate portrait of a man who was a beacon of hope for oppressed people around the world and, in his later years, was recognized as a global citizen and a symbol of humanity and understanding. In addition to relying on Ali himself to guide viewers through his remarkable journey, WHAT’S MY NAME | MUHAMMAD ALI features archival footage, some of it previously unseen. WHAT’S MY NAME | MUHAMMAD ALI is produced with the cooperation of the Muhammad Ali family estate and Jamie Salter, founder, chairman and CEO of Authentic Brands Group, which has been active in preserving the Ali legacy and brand. “As proud guardians of Muhammad Ali’s legacy, we are dedicated to preserving and upholding his core principles, and HBO’s production of WHAT’S MY NAME | MUHAMMAD ALI provides audiences around the world with an intimate connection to this global icon,” says Jamie Salter. The HBO Sports presentation is a Sutter Road Picture Company Production in association with Fuqua Films and SpringHill Entertainment; executive producers, LeBron James, Antoine Fuqua, Maverick Carter, Paul Wachter, Bill Gerber, Jamie Salter and Glen Zipper; directed by Antoine Fuqua; produced by Sean Stuart; co-executive producer, Kat Samick; written by Steven Leckart; edited by Jake Pushinsky. Two-division world champion Lamont Peterson takes on former junior welterweight world champion Sergey Lipinets in a 12-round welterweight match that headlines Premier Boxing Champions on FS1 and FOX Deportes on Sunday, March 24 from MGM National Harbor in Maryland. Coverage on FS1 and FOX Deportes begins at 8 p.m. ET/5 p.m. PT and features Anthony Peterson, Lamont’s brother, battling former junior lightweight world champion Argenis Mendez in a 10-round junior welterweight bout that serves as the co-main event. The Peterson brothers are an inspirational duo that rose from poverty and homelessness in Washington D.C. as children to become professional boxers and reach an elite level in the sport. They will be fighting as the main and co-main event in nationally televised bouts for the first time since 2006 and will look to put on a show for fans just outside of their hometown. Lamont Peterson (35-4-1, 17 KOs) has battled some of the top names in the sport at 140 and 147-pounds in climbing through the ranks and winning titles in both divisions while facing the likes of Victor Ortiz, Timothy Bradley, Jr., Amir Khan, Kendall Holt, Lucas Matthysse, Danny Garcia and Errol Spence, Jr. The 35-year-old from Washington D.C. won the IBF and WBA 140-pound titles with a split decision victory over Khan in 2011 and won the welterweight championship with a unanimous decision over David Avanesyan in 2017. Peterson is looking to rebound from a loss to Spence in a welterweight title fight last January. Lipinets (14-1, 10 KOs) has moved up to the welterweight division after previously becoming a world champion at 140 pounds. The 29-year-old, who is from Kazakhstan, grew up in Russia and now lives in Beverly Hills, California, picked up the IBF super lightweight world title with a unanimous decision victory over Akihiro Kondo in 2017. He lost the title by decision to Mikey Garcia last March and rebounded to defeat Erick Bone in his welterweight debut. The 33-year-old Anthony Peterson (37-1, 24 KOs) is the younger brother of Lamont Peterson and has won seven straight fights since losing by disqualification to Brandon Rios in 2010. Five of his last eight wins have come inside the distance and he will look to put himself into title contention facing his toughest competition in years on March 24. Mendez (25-5-1, 12 KOs) won the IBF super featherweight title with a knockout victory over Juan Carlos Salgado in 2013. He has put together two straight victories since losing back-to-back fights to Luke Campbell and Robert Easter Jr. at lightweight in 2016. The 32-year-old, who is from San Juan de la Maguana, Dominican Republic and now lives in Brooklyn, N.Y., scored a unanimous decision over Eddie Ramirez in his last fight in May after defeating Ivan Redkach the previous year. Undefeated Kazakhstani dynamo Bakhtiyar “Bakha Bullet” Eyubov has been added to the special two-hour UFC Fight Pass live stream (7:30 pm ET/6:30 pm CT) on Friday, February 15, from the Kansas Star Casino in Mulvane, Kansas. Eyubov (14-0, 12 KOs) will face Mexican veteran Jose Luis “La Boa” Rodriguez (25-12, 13 KOs) in an eight-round super lightweight showdown. The live stream, presented by Salita Promotions will also feature US Olympic bronze medal winner Nico Hernandez, women’s top contender Elena Saveleva and undefeated heavyweight puncher Apti Davtaev in separate bouts. A born showman, Eyubov’s relentlessly aggressive fighting style has won him new fans with every fight. The young slugger says he’s looking forward to bringing his mayhem to a new audience through the UFC. Eyubov was last seen taking out 21-1-1 Nicholas Givan in seven rounds last June. His promoter, Dmitriy Salita, says he’s happy his entertaining slugger is back in action. “Bakha is one of the most dominant contenders in the sport. I look forward to an exciting performance from him on one of the leading combat platforms in the works in UFC Fight Pass,” said Salita. In a very special bonus that night for online viewers, the commentating team will consist of long-time combat sports voice Sean Wheelock and “2018 Female Boxer of the Year” and women’s world champion Claressa Shields, making her debut behind the microphone. STAR BOXING is excited to return to its renown Long Island venue, The Paramount, on February 22nd, for another thrilling night of “Rockin’ Fights.” The 34th edition of the acclaimed fight series brings extreme boxing talent from across the world, right to Huntington’s, The Paramount. The main event is a real toss-up between the ‘big boys’ in a truly international fight between European champs. Giant Belgium JOEL “BIG JOE” DJEKO will take on Italian challenger, SIMONE “TYSON” FEDERICI in an intriguing 10-round cruiserweight bout. The co-main event will feature the return of Huntington’s own JOHNNY “HITMAN” HERNANDEZ who will be taking on upset minded, MARQUIS “THE HAWK” HAWTHORNE. The main event features two international cruiserweight prospects who will travel a combined 7,873 miles to meet in the squared circle, in front of the expected packed crowd at The Paramount. Belgium’s Djeko (14-2-1 7KO’s), an IBO Champion, stands at a towering 6’5″ and breaks the will of his opponents by fighting behind his jab, followed by devastating power in both hands. Djeko’s marquee win came against then undefeated MARIANO ANGEL GUDINO (then 12-0 7KO’s), when he defeated the Argentinian by wide unanimous decision, dominating for the full ten-rounds, to secure the IBO Continental Cruiserweight Title. Djeko has fought in America only once before, but intends to begin laying roots state side, for an eventual shot at a cruiserweight world title. Djeko’s only 2 losses were on the road and by majority and split decision against undefeated prospects. Federici (14-1-1 6KO’s), a 25-year-old Italian who resides in Roma, Italy, will be making his debut on American soil on the February 22nd Paramount show. Federici had an impressive amateur record of 35-1-1. As a professional, Federici defeated FRANCESCO CATALDO in a thrilling battle earning the Italian Cruiserweight Title. Since then, Federici has successfully defended his title twice, most recently defeating the dangerous Georgian, ZURA MEKERESHVILLE by unanimous decision to add the IBF Mediterranean Cruiserweight Title to his pedigree. Federici has his eyes set an a massive victory on February 22nd main event. Federici and Djeko both have their eyes set on victory in the February 22nd main event and both know a top rankings in the cruiserweight division are at stake. In the co-main event, fans will see Johnny “Hitman” Hernandez (9-4 1KO), a familiar face at The Paramount having fought eleven of his thirteen professional fights at the venue. Hernandez who is known for his footwork and great conditioning, always seems to get stronger as the fight carries on. This will be Hernandez second main event at The Paramount. He was last seen in an absolute thriller with fellow Star Boxing stablemate DANNY “EL GALLO” GONZALEZ (then 16-1-1 7KO’s). Over the ten-round main event, Hernandez and Gonzalez exchanged blow after blow at the center of the ring, as the crowd seemed to be on their feet throughout the fight with consistent and vocal support for both fighters. While the judges scored the bout in favor of Gonzalez by majority decision, Hernandez proved to the rowdy sold out crowd that he has the skill to fight the upper echelon of the 140 lb. division. Gonzalez went on to fight fellow Paramount alumni CHRIS ALGIERI at Madison Square Garden a few weeks ago. Hernandez promises to return with vengeance on February 22nd in his Paramount hometown. Hernandez will be facing the very tough Texan, Marquis Hawthorne, who will be making his second appearance at The Paramount. Over his twelve-fight career, Hawthorne has fought ten undefeated prospects, with an opponent combined record of 81-23-3. Most recently, Hawthorne (6-9 1KO) won in a shocking upset at Mohegan Sun on January 26th over amateur standout and undefeated professional, from Detroit, Michigan RONNIE “TEFLON RON” AUSTION (then 10-0 7KO’s). Over the 6-round bout, Hawthorne commanded the action, using his long reach and height advantage to maintain his distance, landing grueling right hands to the body and the head of Austion. At the final bell, the scorecards read 57-56, 58-55 and 59-54, earning a massive upset victory for Hawthorne over the previously undefeated Austion. The main event between European cruiserweight champions in Djeko and Federici is destined to excite. The co-main event will see Hernandez in front of his hometown fans while Hawthorne will look for a second consecutive upset. Undercard to be announced soon.